Here is a man with a mission; a downtown character who is recognized for the ball he has tucked under his arm at all times (except when he has a clear shot at a kick down an empty stretch and somewhere in my files is a picture of him doing such a thing at 05:00 on a snow-covered Hastings Street). 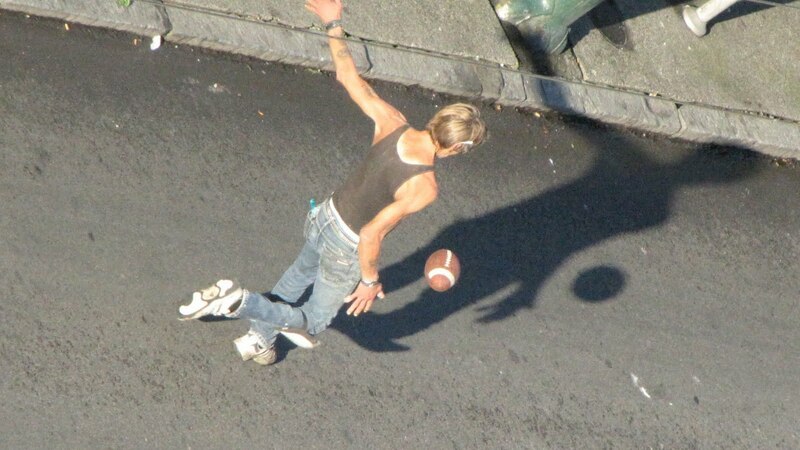 He practices pride of place on his daily tours of the neighbourhood; picking up every bit of trash he sees in his path and stopping only for a cigarette or to do a spot of calisthenics with the aid of his football. He is a fine example of a person making the best of a tricky situation while maintaining his humanity. Somebody should validate him for his effort but this is 2010 and the system has been thoroughly campbellized.